New York Times columnist Maureen Dowd in conversation with David Axelrod and Carl Hulse, the chief Washington correspondent for the Times. 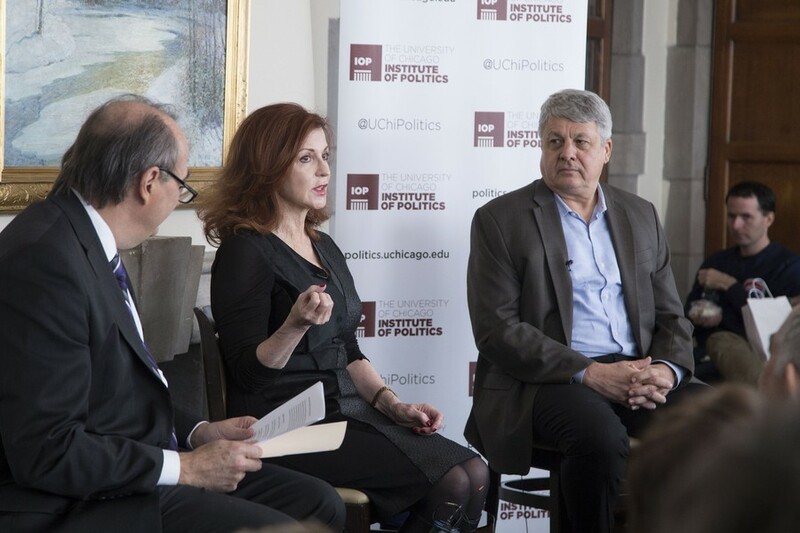 David Axelrod sat down on Friday with Maureen Dowd, Pulitzer Prize–winning columnist for The New York Times, and Carl Hulse, chief Washington correspondent for the Times, for the latest in a series of conversations about the presidential campaign. Dowd opened with her characteristic colorful language. Hulse agreed that Trump has been surprised by his own success. Axelrod asked the panel to address Trump’s unpredictable, often self-destructive behavior. “He self-destructs, because he’s a clinical narcissist and he can’t stop himself, and celebrity is like his heroin and he’s in an overdose now, and every rejection, every humiliation, is a small death,” Dowd said. “There are rage rooms opening across the country where you can go in and destroy a TV set with a baseball bat. To some of these people, Trump is the baseball bat,” Dowd said.